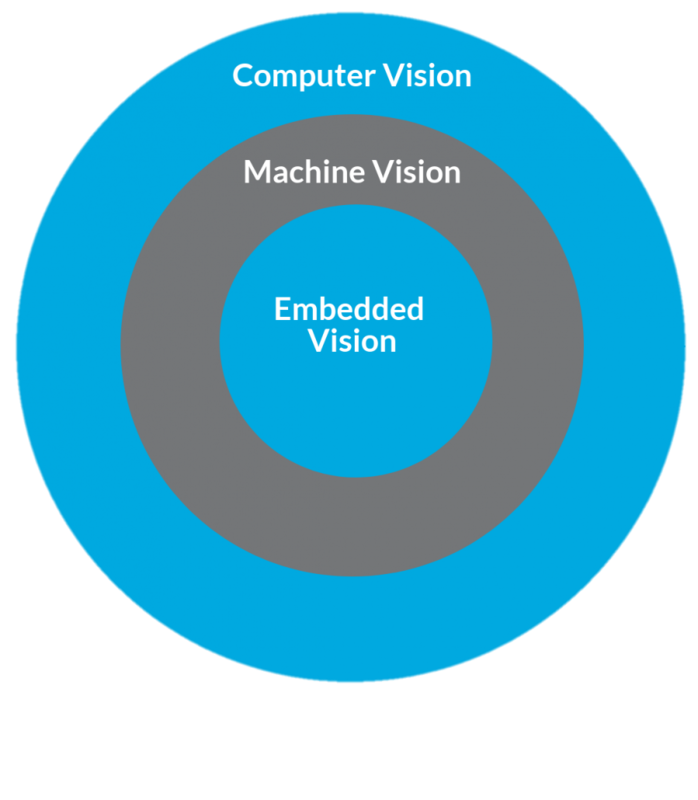 What is the difference between Computer Vision, Machine Vision, and Embedded Vision? Machines with the ability to “see” are no longer science fiction. They have become an integral part of industrial automation and quality assurance systems and can also be found in autonomous vehicles or safety systems. As technological development progresses, vision capable machines are taking over increasingly complex tasks in a wide variety of specialized applications. In this context, it is important to distinguish between three different terms with overlapping meanings which are often used synonymously: computer vision, machine vision, and embedded vision. Computer vision (CV) is the most comprehensive of the three and refers to the scientific field that deals with the extraction of information from images using computers. Computers can therefore learn to analyze and understand digital images and videos. The goal is usually to derive a decision from the image content, or to use “intelligence” to process the image itself. The fields of application for CV are diverse and typically include areas where humans rely upon their visual perception. Machine vision (MV) means the use of imaging sensor systems and CV methods to control machines. In addition to one or several sensors, a MV system also contains an image processing unit. The task often involves the recognition of defined characteristics or properties of an object, after which specific predefined actions are executed. The environment, (i.e., lighting and/or movement) is controlled, and the typical observed events are often predictable. Furthermore, many MV applications are subject to real-time requirements. Therefore, MV refers to a specialized form of CV for certain fields of application. One example is systems that visually inspect production lines for quality assurance. These systems insure that, for example, fill level criteria is met or that the application of labels and sealing caps is within the specified tolerances. The systems then trigger different actions based on the analysis, such as the redirection of faulty products or stoppage of the production line. However, the term is nowadays used with less precision and can also refer to applications in high-end surveillance, medicine, life science, or even in driver assistance systems. one or several systems for image capture, consisting of lenses and imaging sensors. Sensors operate in different spectral ranges of light: natural light, monochrome, NIR (near infrared), LWIR (long wave infrared) or UV (ultraviolet); RADAR or LIDAR sensors can also be used. image processing software and algorithms, e.g., pattern recognition. Embedded vision (EV) systems are cheaper and more compact than traditional industrial EV systems, but still meet the same (or higher) functional and non-functional requirements. However, they often operate under more demanding environmental conditions, where vibration and shock resistance as well as suitability for extended temperature ranges are essential. The miniaturization of electronics makes it possible to directly integrate image processing systems, camera modules, and computer platforms into machines, devices, and products. The result is embedded vision systems with a compact design. Computer platforms are characterized by their low power consumption, small size, and cost efficiency. Tailor-made processing boards and baseboards with system-on-modules (SoM) serve as computing units. There is no need for a traditional industrial computer. Sensors are also frequently integrated into the computing platform, e.g., board-level cameras. The outcome is an optimized and fully embedded system.